Russians believe, that the Euromaidan was organized and sponsored by the West (mainly by USA) to replace the pro-russian Yanukovych’s regime with an own puppet one. In particular, they claim, that it was implemented through pro-West NGOs (especially, mass media), which, according to their beliefs, inspired dissatisfaction amongst ukrainian people. 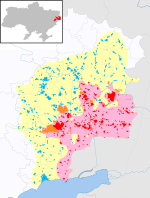 The confrontation between the ukrainian East and the ukrainian West as well as the “infringement” of rights of Russian speakers in Ukraine also started long before the Euromaidan (not after it, for sure)… Thus, in distant 2006 according to the statement of the Foreign Ministry of the Russian Federation, it was venturesome to speak Russian in Ivano-Frankivsk (a city in the Western Ukraine). But, actually, it was “venturesome” only in this statement of the Russian MFA! In reality in Ivano-Frankivsk (the city I live and do speak Russian in) no one was persecuted for the Russian language. The similar can be said regarding the fascists and Nazis – you were always able to find out, that there were many of them in Western Ukraine, only if you watched or read Russian mass media. In reality there are no popular truly Nazi organizations in Ukraine! For comparison, Russia has the plenty of such organizations (for example, RNU, NSS and Slavic Union). 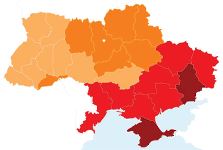 The only thing, which is close to the truth, is the popularity of nationalism in the Western Ukraine, but, in my opinion, this popularity was caused by doings of the Kremlin (and its henchmen)… Thus, western natives’ resentment and additional aspiration to protect the ukrainian nation were caused by the act of vandalism against the ukrainian national coat of arms on Mount Hoverla, popularization by russians of the “Ukraine project” theory (teaching, that Ukraine is an “artificial state” and ukrainians are “fake nation”), the statement of the Russian president Vladimir Putin claiming, that “Ukraine is not even a country”, and so on. Russians believe, that this was the West (mainly USA), who had been setting the ukrainian West at variance with the ukrainian East and Russia. To substantiate the popularity of fascism in the ukrainian West russians also often remind Stepan Bandera, who, they claim, was a Nazi ally (and he was not, actually). 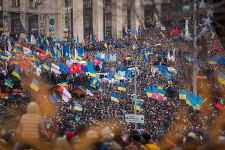 Initially the Euromaidan intended to put pressure on Viktor Yanukovych to make him sign the agreement of association with EU in Vilnius on November 29, 2013… After the violent dispersal of the Euromaidan on the night of November 30, 2013 and after the failure to sign the agreement by the government (what was accompanied by lies) the Maidan also started to demand the resignation of the cabinet… After the “dictatorship laws“, that were adopted by the Verkhovna Rada (the parliament of Ukraine) with a number of procedural violations, the Euromaidan also started to demand the dissolution of the Verkhovna Rada… Also, soon after the rally had started people began to realize, that the president Viktor Yanukovych is the source of all these problems. Therefore, eventually the Euromaidan started to demand the resignation of the president. But, whatever the Euromaidan demanded of authorities, they were not even intended to comply with those demands! On the night of November 30 Viktor Yanukovych attempted to intimidate the Maidan (with the violent dispersal), but got the opposite effect… After that authorities attempted to ignore the Maidan. Then through laws and courts they attempted to make people “not to prevent them from doing their job”… Only when it became already too late, the prime minister Mykola Azarov finally decided to resign (I guess, he had realized, how was it going to end). In fact, this became the only demand, that was met, but at that moment the Maidan already demanded a full reset of power. Certainly, demands of protesters were getting bolder as the Yanukovych’s regime was actually ignoring them during months! Almost during all the time the rally lasted the Euromaidan was supported by the opposition leaders (they actually joined the rally in a few days after the start): Vitali Klitschko, Arseniy Yatsenyuk, Oleh Tyahnybok, Petro Poroshenko, and others. But their authority was never high! Russians believe, that americans not only organized the Euromaidan but also led it. On February 21, 2014 European Union representatives, the opposition leaders and Viktor Yanukovych (in the presence of Russian Federation’s representative) signed the peace deal aimed to settle the crisis. 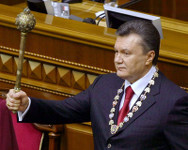 This deal stipulated the reelection of the president of Ukraine in… a half of year. Certainly, many protesters were not happy with the deal, as during just a couple of (preceding) months Viktor Yanukovych managed to spoil and take many lives! And now he was about to have another half of year! The opposition leaders, unlike ordinary protesters, were happy to find at least some resolution for the situation, but they did not have sufficient impact on protesters! Russians believe, that this was a coup d’etat, that the opposition usurped the power and that this was the opposition, who used weapon to kill peaceful protesters and policemen. After this, according to their beliefs, the opposition seized the parliament and forced deputies to change the Constitution and to appoint the speaker and the prime minister. That’s why russians call the current regime in Ukraine a “junta“. They also think, that Viktor Yanukovych did not escape, but just travelled to Kharkiv to attend the party conference and only there he realized, that he was in danger. 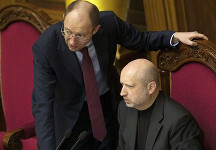 Russians also claim, that this was the opposition, who frustrated the peace deal. Russians believe, that crimean people chose to join the Russian Federation of their own free will, what, they claim, was proved by the “results” of the referendum. They also believe, that the referendum was organized and conducted by the legitimate authority of the peninsula and fully complied with the democratic standards. Russians think, that the decision to “return” the Crimea was made by Vladimir Putin off-the-cuff mainly to prevent oppression of Russian-speaking people on the peninsula. Thus, they treat the failed attempt by the Verkhovna Rada to repeal the faulty law on regional languages as the attempt to persecute the Russian language. 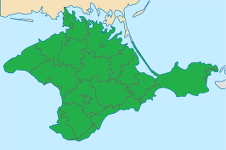 Other russians ensure, that Vladimir Putin was obliged to annex Crimea due to the threat of establishing a NATO base on the peninsula. Generally, russians are sure, that crimean people are going to live better and more serenely under the Russian Federation. Regarding the “little green men” russians have no doubt, that their order was just to secure the people’s will. Other russians claim, that this was the plan to seize the peninsula without a single shot fired, what shows how cool are special forces of the Russian army.